Engineered to handle heavy-duty turning applications with superb accuracy, the GA series ultra performance turning centers combine extremely powerful high torque motors, super rigid box way constructions, and large diameter servo indexing turrets to bring you The Ultimate Machining Power®. The GA series will help you be more competitive by achieving faster cycle times with heavier cuts, faster machine movements, and allow cutting of tough material efficiently. You'll also appreciate the reliability and durability that our machines are known for. Plus, with more standard features than any other machine on the market today, many say it's the best investment they have ever made. In order to endure the machine's high outputs with durability, heavy-duty roller bearings are used to support the spindles and axes guide ways are of super-rigid one-piece box ways. A total of 26 models are available in the GA Series lineup, use the chart below to pinpoint the model that best suits your applications needs. 8" 8" / 10" 10" 10" 12" 15"
*1 Turning length listed here are approximate numbers, individual models may vary. Please see Machine Specifications below for details. The modern 30° slant wedge bed design provides smooth chip disposal and easier operator access without sacrificing machine rigidity. 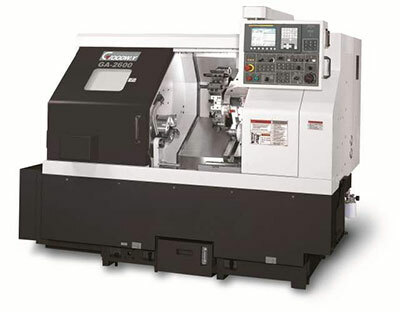 GA Series machines ( excluding compact bed C models ) feature a standard programmable base and quill tailstock. Manual mode quill-jog function allows the quill to be inched forward, which makes it easier to insert the center into the center hole. Movement of the base and quill in auto mode are controlled by M-codes and thrust pressure is manually adjustable. Z-axis carriage automatically locks onto the tailstock base and moves it to the desired position with precision accuracy. Machine rigidity is increased by eliminating the opening required for under-machine-type coolant tanks. Utilizing unused space, this coolant tank placement allows optimal air circulation for faster heat dispersion and lower coolant temperature, which will help extend coolant life. Heat escapes directly into the air, not trapped inside the machine; this tremendously improves the machine's overall accuracy by lowering thermal expansion effects to a minimum. Coolant tank allows the connection of compressed air to circulate coolant and keep it fresh when machine is not in use. Less space limitations allow larger 55 gallon coolant tank capacity and easier maintenance access. Auto industry manufactures require machines with compact footprints and rear discharge conveyor systems to streamline their production lines. We offer the GA-2000 series C models to meet the demand. With the machines placed closer together, operators spend less time walking and are less exhausted, thus, lowering the demand on manpower and increase efficiency. Rear discharge conveyor systems allow machines to be placed closer together, thus, requiring less floor space. Furthermore, all machine conveyors can discharge onto a central conveyor, which carries the chips to one location; this saves man power and streamlines the chip removal process. The standard chip conveyor features adjustable timers that allow the operator to set operation intervals according to the amount of chips generated by the machine. Thus , reducing coolant loss to a minimum. 12 Std. / 10 Opt. Ø 10" ( 12" ) Ø 12" ( 15" ) Ø 15"
*2 Work piece supported by chuck & tailstock. *3 Individual models may vary, please see interference drawings.